Shirts With Random Triangles: Akron St.-Michigan "glazed doughnut" game will give out free doughnuts to students. Akron St.-Michigan "glazed doughnut" game will give out free doughnuts to students. YOU get a doughnut! And YOU get a doughnut! And YOU get a doughnut! Earlier this week Michigan head football coach Brady Hoke refereed to Saturday's Wolverine home game against Akron as a "glazed doughnut game." This terminology allegedly refers to Hoke's youth playing Pop Warner football, when he would supposedly get a doughnut on his way to the game. "You'd get up in the morning, right, and the first thing you'd do, I had one of these bikes that had the handlebars -- with a wheelie bar and a banana seat," Hoke recalled. "I'd put my uniform on, and my helmet -- I usually wore it. I'd go to the doughnut shop and get a glazed doughnut. "Then I'd go to the ball field and go play. And so, any time we play at noon (or earlier), we call it a glazed doughnut game." At least that's his story and he's sticking to it. It was speculated that Hoke was making a jab at MAC conference Akron not quite being on the level of Michigan. Though it obviously can't be proven one way or the other. 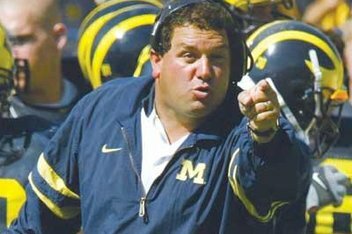 In reality, Hoke promised during the offseason he would provide free doughnuts to students who arrived early for the start of noontime games at Michigan Stadium. He's making good on that promise this Saturday as the school will hand out 5'000 free Tim Horton's doughnuts before the game. Akron-Michigan is the only game on the Wolverines' schedule so far in 2013 to have a noontime start, so this could end up as a one-time event.